Lame Adventure 86: Please Do Stop the Music! Today Elvis has been dead for thirty-three years and Madonna turns fifty-two. Although I liked much of Elvis’s music, I could have easily lived without seeing most of his mediocre movies, and as for Madonna, her films are so bad, she makes Elvis seem like Laurence Olivier. As for Madonna’s music, I am not much of a fan of that, either. Yet, four years ago I had a friend who was hell-bent on seeing Madonna at Madison Square Garden when she was on the Confessions tour. If I recall correctly, the sponsor was Geritol. The ticket cost $169.50 and I still suffer chest pain when I think of all the other entertainment events I would have so preferred to see aside from the Material Middle Aged Girl gyrating all over a hydraulic horse while singing Like a Virgin. Also, the date we saw her was July 2nd. It was very hot and very humid both inside and outside the arena for she insisted that air conditioning dries out her throat. It never occurred to me until then that a performer whose entire career has been based on shock and style with scant vocal ability posing a distant third on her talent chart, would suddenly channel her inner Maria Callas, but she did. I can still feel the sweat trickling down my back while watching her perform. One positive aspect of Madonna is that her music is so forgettable, it never sticks in my head, and that I appreciate very much. 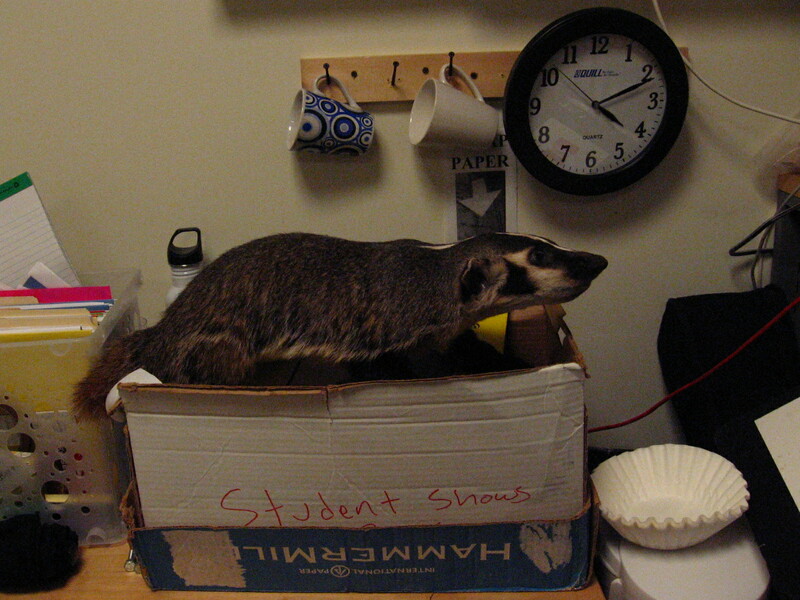 A stuffed badger theatrical prop that was not used in any Elvis film nor on the Confessions tour. Although one generally thinks of music as a source of pleasure, except perhaps when the military uses it as a form of audio assault, on a much more reduced level in everyday life, it can also be quite painful. For example, my normally indifferent boss, Elsbeth, cannot refrain from vocalizing her disdain whenever she hears Sometime Around Midnight by the Airborne Toxic Event. One of our former assistants played that song on her boom box and I warned her to never play it in The Boss’s presence unless she had a death wish. My sidekick, Greg, is convinced that he’s being stalked by Dishwalla’s Counting Blue Cars. There may be some validity to this for it is uncanny that this fifteen-year-old song always seems to play on the radio whenever he is sitting at his desk. My dear friend, Milton, practically transforms into the Wolfman whenever he hears Rihanna, but he seems to have particular contempt for Please Don’t Stop the Music. As for me, aside from Barney crooning the I Love You song, Kylie Minogue’s Can’t Get You Out of My Head, is enough to make me want to rent a Zipcar and drive it off a cliff. I am certain that anyone reading this post has at least one song, if not a number of songs, that is both torture to hear and sheer agony when stuck on one’s internal iPod. Possibly it’s a song by either Elvis or Madonna. This entry was posted in Humor and tagged badger, barney, confessions tour, dishwalla, elvis, kylie minogue, madison square garden, madonna, the airborne toxic event. Bookmark the permalink. I think I’ve said this before, but Send In The Clowns, by anyone, is enough to make me contemplate slashing my wrists. Mine is a person… Mariah Carey. Madonna will always be my favorite. Hope you still like me.